Hydrogen peroxide (H2O2) is generated as a by-product of metabolic reactions during oxygen use by aerobic organisms, and can be toxic or participate in signaling processes. Cells, therefore, need to be able to sense and respond to H2O2 in an appropriate manner. This is often accomplished through thiol switches: Cysteine residues in proteins that can act as sensors, and which are both scarce and finely tuned. Bacteria and eukaryotes use different types of such sensors—either a one-component (OxyR) or two-component (Pap1-Tpx1) redox relay, respectively. However, the biological significance of these two different signaling modes is not fully understood, and the concentrations and peroxides driving those types of redox cascades have not been determined, nor the intracellular H2O2 levels linked to toxicity. Here we elucidate the characteristics, rates, and dynamic ranges of both systems. By comparing the activation of both systems in fission yeast, and applying mathematical equations to the experimental data, we estimate the toxic threshold of intracellular H2O2 able to halt aerobic growth, and the temporal gradients of extracellular to intracellular peroxides. By calculating both the oxidation rates of OxyR and Tpx1 by peroxides, and their reduction rates by the cellular redoxin systems, we propose that, while Tpx1 is a sensor and an efficient H2O2 scavenger because it displays fast oxidation and reduction rates, OxyR is strictly a H2O2 sensor, since its reduction kinetics are significantly slower than its oxidation by peroxides, and therefore, it remains oxidized long enough to execute its transcriptional role. We also show that these two paradigmatic H2O2-sensing models are biologically similar at pre-toxic peroxide levels, but display strikingly different activation behaviors at toxic doses. Both Tpx1 and OxyR contain thiol switches, with very high reactivity towards peroxides. 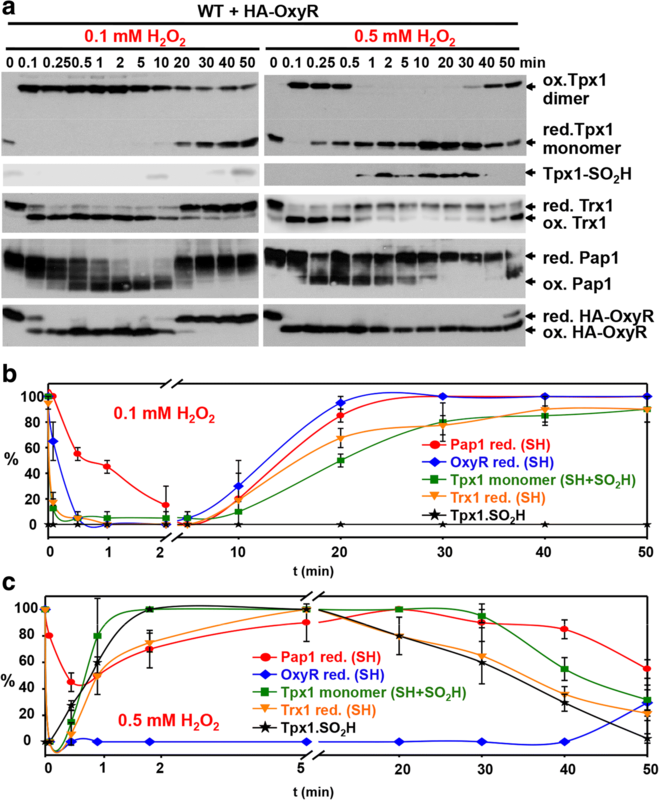 Nevertheless, the fast reduction of Tpx1 defines it as a scavenger, and this efficient recycling dramatically changes the Tpx1-Pap1 response to H2O2 and connects H2O2 sensing to the redox state of the cell. In contrast, OxyR is a true H2O2 sensor but not a scavenger, being partially insulated from the cellular electron donor capacity. The use of oxygen by aerobic organisms in several metabolic reactions has the side effect of the toxicity associated with oxygen by-products such as hydrogen peroxide (H2O2). The possible toxic effects exerted by oxygen-derived species are counteracted with antioxidant systems, so that a proper intracellular environment is maintained. In addition to this toxicity, decades of work support the participation of H2O2 in signaling events, based on its capacity to diffuse in space and through membranes, and its discriminate reactivity towards specific cysteine (Cys) residues in proteins. The toxicity associated with H2O2 may be due to direct inactivation of enzymes or to its conversion to the more reactive species hydroxyl radical, and it normally leads to irreversible modifications of protein backbones or of amino acid side chains. However, the direct oxidation of Cys and, to a lesser extent, methionine residues with H2O2 can give rise to reversible modifications, such as sulfenic acid or disulfides or as methionine sulfoxides, respectively, which can be reduced by cellular activities. Reversible Cys oxidation has been unambiguously shown to participate in the activation of H2O2 signaling cascades. However, free Cys, small thiols, and most Cys in proteins react quite poorly with H2O2, with rate constants of the order of 10 M− 1 s− 1 , indicating that their oxidation cannot be accomplished during rapid physiological peroxide fluctuations. Thus, Cys in proteins must display low pKa, to enhance the thiolate fraction, as a prerequisite for fast and efficient oxidation by peroxides, although its nucleophilicity (to attack the H2O2 electrophile) and its capacity to stabilize both the transition state with the reactant, H2O2, and the leaving group (which occurs after the rupture of the peroxidic bond) also has to be preserved [2–4]. Few Cys in proteins fulfill those premises, and have as a consequence exquisite sensitivity and specificity to react with H2O2. The fast and reversible reaction of peroxides with those Cys residues in proteins, two conditions for signaling, provides the basis by which H2O2 triggers intracellular signaling cascades [5–7]. These Cys residues in specific proteins are called thiol switches, since they can switch the activity of the H2O2 sensor protein on and off. The high reactivity of these thiol switches with peroxides (with rate constants ranging from 105 to 107 M− 1 s− 1 ), along with the ability of H2O2 to diffuse through membranes, make H2O2 one of the oxidants better suited for signaling. Even though some bioinformatic tools have been proposed to predict Cys reactivity in silico , currently real H2O2 protein sensors can be demonstrated only experimentally, and this has been accomplished with the pioneer work on bacterial OxyR , and the later characterization of the eukaryotic redox relays Gpx3-Yap1  and Tpx1-Pap1 [12, 13]. 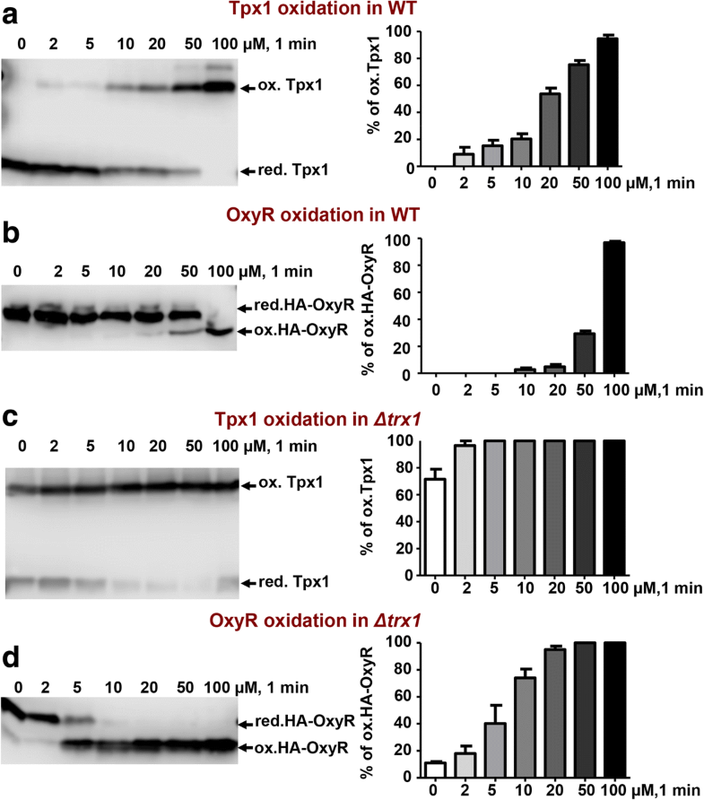 The transcription factor OxyR, which has a reaction rate with H2O2 of 1.1–1.7 × 105 M− 1 s− 1 [14, 15], is a tetramer that binds to the promoter of target antioxidant genes before and after stress sensing . Upon activation by peroxides, OxyR suffers conformational changes, becoming a potent activator of transcription . Low concentrations of H2O2 are sufficient to activate OxyR fully and transiently through Cys oxidation to a disulfide bond [10, 14] (Fig. 1). Glutaredoxin (Grx) 1, with the glutathione (GSH)-GSH reductase-NADPH as the electron donor system, reduces the transcription factor back to the inactive conformation . Although some other models have been proposed for oxidation by other agents [18–20], it is widely accepted that H2O2 reacts with the thiol switch Cys199 in OxyR to yield an unstable sulfenic acid, which reacts with Cys208 to form a metastable intramolecular disulfide bond . In fact, the fast, reversible, and specific interaction of OxyR with H2O2 has been exploited in the design of HyPer, a genetically encoded biosensor that enables real-time imaging of peroxides in living cells, and which is based on the insertion of a yellow fluorescent protein into the sequence of OxyR [21, 22]. In eukaryotes, the activation of signaling cascades uses a different strategy. 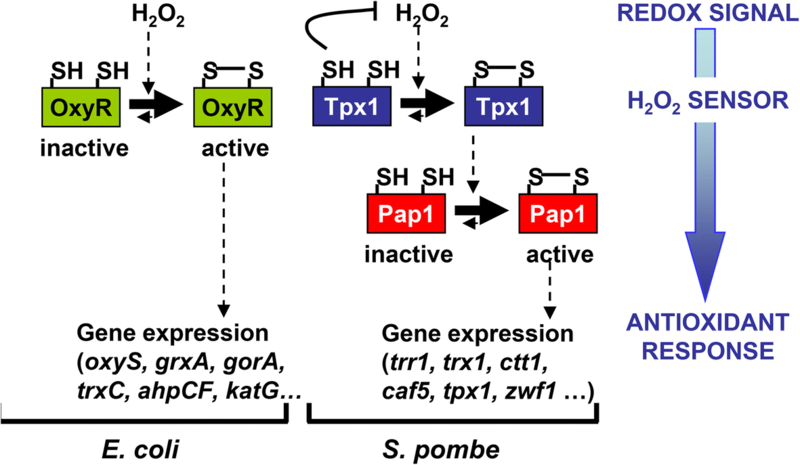 The redox-dependent transcription factors Yap1 in Saccharomyces cerevisiae and Pap1 in Schizosaccharomyces pombe rely on upstream components, the real H2O2 sensors, to sense oxidative stress: the glutathione peroxidase Gpx3 and the peroxiredoxin (Prx) Tpx1, respectively [11–13] (Fig. 1). In S. pombe, Tpx1 has also been described as the main peroxide scavenger during aerobic growth, so that cells lacking this Prx can grow only under anaerobic conditions on solid plates . 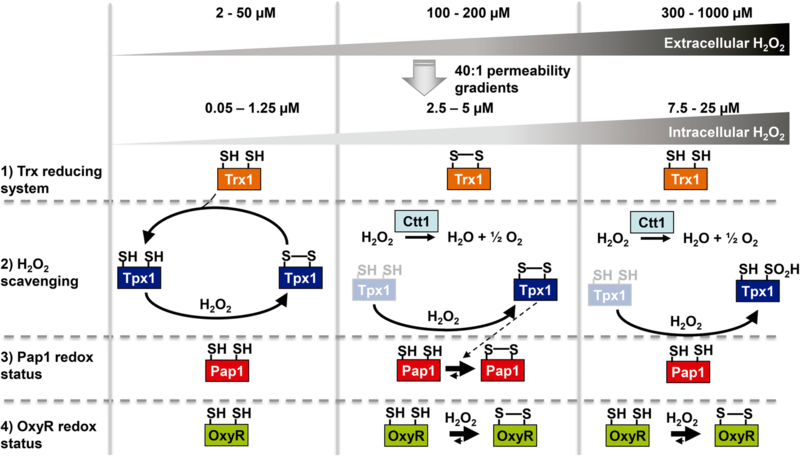 Another interesting aspect of Tpx1 and most eukaryotic Prxs is their inactivation by high H2O2 levels through hyper-oxidation of the reactive Cys to sulfinic acid (SO2H), allowing a temporal build-up of peroxides and a lack of activation of Pap1 [12, 13]. Importantly, Prxs are inactivated while engaged in their catalytic cycles, with higher inactivation values as the reaction rates increase . As with most Prxs, the intracellular concentration of the Tpx1 dimer is very high, around 3.5 μM (2 × 105 copies per cell) according to proteome-wide studies . 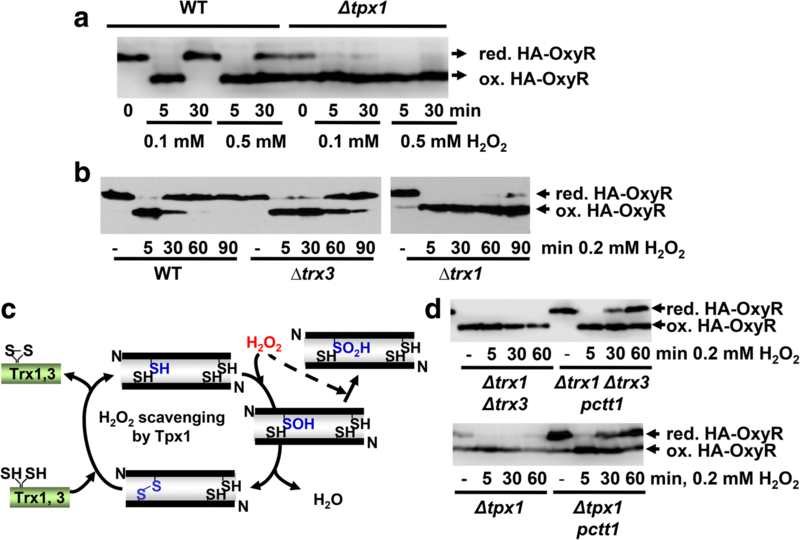 An interesting proposal by Winterbourn and Hampton is that the highly abundant Prxs, upon oxidation by peroxides, may trigger the otherwise weak oxidation not only of signaling cascades but also of the general thiol proteome . Nevertheless, direct oxidation of proteins harboring low-reactive thiols may proceed supported by localized H2O2 pools and specific protein interactions . To describe H2O2 sensing and signaling unambiguously by the one- and two-component models described so far, we have expressed bacterial OxyR in fission yeast at a concentration similar to that of Tpx1. We first confirmed that OxyR oxidation does not require Prxs, and that in S. pombe it depends on the thioredoxin (Trx) system for recycling, although the kinetics of oxidation by peroxides are significantly faster than its reduction, and concentration of peroxides is prevalent in the presence of reduced Trxs. At higher doses of peroxides, the hyper-oxidation of Tpx1 unlinks Pap1 activation from peroxide concentrations, inducing a dual temporal wave of Pap1 oxidation; the first wave of activation is too transient to trigger an antioxidant response. Since in our system OxyR strictly responds to intracellular peroxides without affecting their concentration, we determined the intracellular steady-state concentrations of H2O2 based on OxyR oxidation in cells lacking Tpx1, and concluded that 0.3 μM of intracellular peroxides can halt the growth of S. pombe on solid plates. By applying mathematical equations to our experimental data, we demonstrate that the permeability of H2O2 allows an extracellular-to-intracellular peroxide gradient of around 40-fold at sub-toxic levels (100–200 μM), but peroxide scavenging, mainly driven by Tpx1 at low doses of peroxides and initial time points, generates transient gradients of 300-fold. We fully describe the common and specific features of these two types of redox relays, and use their oxidation kinetics to define the H2O2 intracellular gradients, the cellular scavenging activities governing at different peroxide ranks, the redox state of the Trx-reducing system, and the status of both signaling cascades. We also discuss how these two types of redox relays impact the modularity of H2O2 sensing and its insulation from the redox state of the cell. Bacterial OxyR oxidation by peroxides was described 15 years earlier than the peroxidase-dependent activation of eukaryotic transcription factors (Fig. 1). To confirm the properties and kinetics of OxyR, we expressed HA-tagged OxyR in fission yeast at levels similar to those of the H2O2 sensor Tpx1. As shown in Fig. 2a, full and transient OxyR oxidation can be accomplished at 0.1 mM extracellular peroxides. Tpx1 is not required for OxyR oxidation (Fig. 2a, Δtpx1 + HA-OxyR), and a strain lacking all four S. pombe thioredoxin peroxidases (Tpx1, Gpx1, Pmp20, and Bcp1) is still capable of oxidizing OxyR (Additional file 1: Figure S1a), confirming that OxyR contains a true thiol switch. In fact, deletion of Tpx1 promotes OxyR oxidation either in the presence of H2O2 or under basal conditions (Fig. 2a; see below). Cells possess two major cascades, the Trx and the Grx/GSH systems, to maintain thiols in their reduced form, and to reduce disulfides formed upon oxidant exposure or after specific enzymatic reactions [27–31]. The S. pombe genome contains genes coding for two cytosolic Trxs, one dithiol cytosolic Grx, one Trx reductase (Trr1), and one GSSG reductase (Pgr1) . We performed long kinetics after H2O2 imposition, and observed that OxyR returned to the reduced form after 30–60 min of 200 μM stress (Fig. 2b), when significant levels of H2O2 are still present (see below, in Section 2.3), indicating that heterologous OxyR is being actively reduced by the S. pombe reducing systems. While the absence of Grx1 or Pgr1 had no effect on the basal levels of OxyR, or on its reduction after H2O2 stress (Additional file 1: Figure S1b), the individual deletion of either of the genes coding for cytosolic Trxs, trx1 or trx3, had a long-term impact on the recycling of OxyR after stress imposition (Fig. 2b). In particular, OxyR remained oxidized 90 min after H2O2 stress in ∆trx1 cells. The absence of both cytosolic thioredoxins Trx1 and Trx3 triggers constitutive oxidation of OxyR (Fig. 2d, top panel). Therefore, two strain backgrounds (∆tpx1 and ∆trx1 ∆trx3) display constitutively significant oxidized OxyR in the absence of added peroxides. However, these results are not direct evidence for the role of the Trx branch in the reduction of OxyR. As mentioned in the Section 1, the Prx Tpx1 is the main scavenger of H2O2 during aerobic growth , and cytosolic Trx1 and Trx3 recycle disulfide-linked Tpx1 dimers at the expense of reduced cofactor  (Fig. 2c). The Tpx1 cycle can be poisoned at high concentrations of peroxides through hyper-oxidation of the sulfenic acid form (SOH) to sulfinic acid (SO2H) [12, 13] (Fig. 2c). We hypothesized that in both strains, ∆tpx1 and ∆trx1 ∆trx3, H2O2 scavenging may be compromised, and that enhanced basal peroxides could trigger OxyR oxidation. Indeed, ectopic overexpression of catalase in ∆tpx1 or ∆trx1 ∆trx3 strains fully suppresses OxyR oxidation under basal conditions (Fig. 2d), indicating that OxyR is a sensitive and specific sensor of H2O2 levels. The oxidation/reduction kinetics of protein sensors in signaling cascades can be used to calculate extracellular-to-intracellular H2O2 gradients by combining biological data and applied equations. Our biological system, with one cell type expressing the two models of H2O2-sensing redox relays, and our experimental methodology, which facilitates the in vivo trapping of the thiol redox states within second frames, constitutes a superb model to apply kinetic equations to extrapolate intracellular H2O2 levels. We experimentally applied different concentrations of H2O2 to cultures of a wild-type background expressing HA-OxyR and obtained protein extracts at different time points. We measured by Western blot the percentage of Tpx1 and OxyR oxidation after 1 min of applying increasing extracellular concentrations of H2O2 (Fig. 3a, b), or changing times at fixed peroxide levels (Additional file 2: Figure S2). As shown in Fig. 3a, oxidized covalent Tpx1 dimer can be observed at 2 μM extracellular H2O2, and it only reaches full oxidation at 100 μM peroxides. This pattern of Tpx1 oxidation is identical to that of wild-type cells not expressing HA-OxyR (data not shown). OxyR oxidation does not occur till we apply a dose of 20 μM, which can be explained by the lower second-order rates of OxyR oxidation relative to those of Prxs, but full OxyR oxidation is reached also at 100 μM (Fig. 3b). We then measured OxyR oxidation in the absence of Trx1, which jeopardizes H2O2 scavenging by Tpx1 since the Prx cannot be recycled (Fig. 2c). In Δtrx1 cells, OxyR oxidation occurs at very low concentrations of extracellular H2O2 (Fig. 3d), probably due to the accumulation of intracellular peroxides in this strain background since the main H2O2 scavenger Tpx1 is not being recycled (Fig. 2c). Very similar OxyR oxidation kinetics can be observed in Δtpx1 cells under anaerobic conditions (Additional file 2: Figure S2a). Applying a second-order rate constant of 1.4 × 105 M− 1 s− 1 for OxyR [14, 15], a gradient of 267 ± 8 (n = 2) is obtained by fitting Eq. 1 (see Methods) to the profile of OxyR oxidation observed with H2O2 extracellular concentrations of 20 and 50 μM in wild-type cells (Additional file 2: Figure S2a and Additional file 3: Figure S3a). For lower H2O2 concentrations, this gradient should be higher, as at H2O2 extracellular concentrations of 20 and 50 μM some Tpx1 oxidation is already observed (Fig. 3 and Additional file 2: Figure S2b). Unfortunately, it was not possible to determine the gradient for lower H2O2 extracellular concentrations, because OxyR oxidation was not detected. When Tpx1 is deleted (the Δtpx1 strain), a gradient of 40 ± 9 (n = 6) is obtained under anaerobic conditions, based on profiles of OxyR oxidation observed with extracellular H2O2 in the 2–100 μM range (Additional file 2: Figure S2a and Additional file 3: Figure S3b). This suggests the important role of Tpx1 as a driving force for large H2O2 gradients, which is further supported by the gradient of 42 ± 12 (n = 5) observed in the strain Δtrx1 under aerobic conditions for H2O2 extracellular concentrations between 2 and 50 μM (Additional file 2: Figure S2a and Additional file 3: Figure S3a), in which Tpx1 recycling is compromised . The gradients obtained in Δtpx1 and Δtrx1 strains are likely due to catalase activity (see below). The gradients measured in the previous section were based on the oxidation profile of OxyR observed after addition of H2O2. In this section, we independently corroborate these determinations by measuring gradients based on the extracellular consumption of H2O2. We measured extracellular H2O2 levels in cultures of wild-type, Δctt1, Δtpx1, or Δtpx1 Δctt1 strains after addition of different concentration of peroxides. As shown in Additional file 4: Figure S4, the main intracellular scavenger of peroxides after addition of a toxic concentration of H2O2, 0.5 mM, is catalase. However, at sub-toxic doses of peroxides such as 0.1 mM, both Tpx1 and Ctt1 seem to have an overlapping capacity to scavenge peroxides, since single-deletion mutants Δctt1 or Δtpx1 have a detoxifying capacity similar to that of a wild-type strain, while the decay of extracellular peroxides of Δtpx1 Δctt1 cultures is identical to that of a cell-free system (Additional file 4: Figure S4). Gradients estimated from the ratio between the rate of removal of intracellular H2O2 and the rate of removal of extracellular H2O2 are shown in Table 1. At 0.5 mM H2O2, the pseudo-first-order rate constant (kcons) that characterizes the kinetics of H2O2 consumption was 0.16 s− 1. As referred above, under these conditions, catalase is the only antioxidant responsible for the removal of H2O2, and so it was assumed that the intracellular removal of H2O2 is 6 s− 1 (Table 2). Thus, a catalase-driven gradient of 38 for the wild-type strain (Table 1) when cells are subjected to 0.5 mM was obtained. For the Δtpx1 strain, catalase is probably the main intracellular sink for H2O2 when cells are exposed to either 0.1 or 0.5 mM and generates gradients of 27 and 33, respectively (Table 1). These catalase-driven gradients are like those determined from OxyR oxidation profiles in Δtpx1 and Δtrx1 (Table 3), suggesting that in these strains, catalase is the main sink of H2O2. A reliable determination of gradients driven by Tpx1 was not possible from H2O2 consumption profiles, since at 100 μM, Tpx1 already shows very high levels of oxidation (Fig. 3 and Additional file 2: Figure S2b). This may also explain the apparent overlapping capacity of Tpx1 and Ctt1 to consume H2O2 shown in Additional file 4: Figure S4. Here we analyze how the heterologous expressed OxyR is a functional partner of the redox networks in S. pombe. In Section 2.1, it was not clear whether the Trx1/Trx3 branch was able to reduce OxyR, because the increased oxidation of OxyR observed in mutants for these pathways could not be directly ascribed to a deficient OxyR reduction. For example, in the Δtrx1 strain, Tpx1 activity is compromised, leading to increased levels of H2O2. Thus, the increased OxyR oxidation observed in this strain could be caused either by its increased oxidation or by its impaired reduction. Based on the OxyR oxidation profiles and the gradients determined before, we now address quantitatively the roles played by Trx1 and Trx3 in the reduction of OxyR. Oxidized OxyR is in a near steady state at 5 min (see Additional file 3: Figure S3), and so the rate of OxyR oxidation by H2O2 matches the rate of OxyR reduction by Trx system (Eqs. 2a and 2b in Methods). As can be seen in Table 4, to achieve similar levels of OxyR oxidation—24% and 28%, respectively, for the Δtrx3 and Δtrx1 strains—the levels of intracellular H2O2 need to be much higher in the Δtrx3 strain (0.12 μM) than in the Δtrx1 strain (0.048 μM). Thus, for a much higher rate of OxyR oxidation in the Δtrx3 strain, a similar level of OxyR oxidation is observed, indicating that OxyR is reduced much more efficiently in the Δtrx3 strain. Likewise, for a similar H2O2 intracellular concentration of 0.12 μM in the Δtrx3 and Δtrx1 strains, the oxidation of OxyR is much higher in the Δtrx1 strain (89%) than in the Δtrx3 strain (24%). Therefore, for the same rate of oxidation, OxyR is reduced much less efficiently in the Δtrx1 strain than in the Δtrx3 strain. The predominant role of Trx1 for OxyR reduction is also seen from Additional file 5: Figure S5, in which the pattern of the relation between intracellular H2O2 and OxyR oxidation is similar in the wild-type and Δtrx3 strains, while that of Δtrx1 departs from wild-type behavior. From the highest values of kswitch-off determined in the Δtrx1 and Δtrx3 strains, it can be estimated that Trx1 contributes about 3.2 times more than Trx3 in the reduction of OxyR. The reduction rates of Tpx1 and OxyR in the same strain can be compared with an equivalent rationale, based on the Tpx1 steady-state Eqs. 3a and 3b (see Methods). The maximal kswitch-off measured for Tpx1 is more than 20 times higher than that for OxyR (Table 4), indicating that reducing systems act more rapidly in Tpx1 than in OxyR. Such a higher efficiency probably reflects the true higher reactivity of Tpx1 with reducing systems rather than an inefficient reduction of OxyR by its non-native redox partners of S. pombe, because OxyR is also slowly reduced in bacteria . In this regard, Prxs are characterized by a very high reactivity towards Trxs that are much higher when compared with other thiol proteins . An experimental confirmation that OxyR reduction by Trx1 is not as effective as that of Tpx1 arises from the analysis of its capacity to scavenge H2O2. Thus, a H2O2 scavenging cycle requires fast oxidation of the peroxidase but also a fast reduction to restore its catalytic activity. As determined by Western blot analysis in Fig. 4a, the concentration of OxyR in our fission yeast system is comparable to that of Tpx1 (1.6 μM OxyR and 3.5 μM Tpx1 dimer). We analyzed whether OxyR could also contribute to basal H2O2 scavenging and therefore, suppress the phenotype of cells lacking Tpx1. 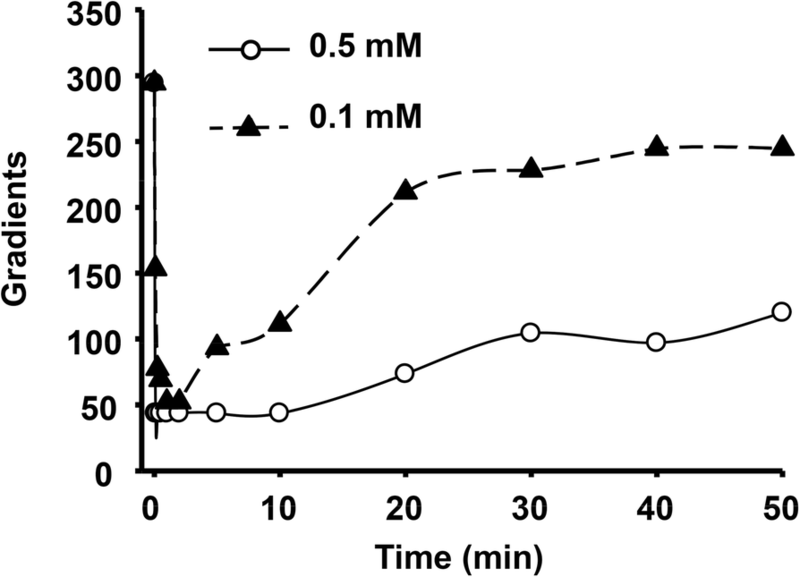 While overexpression of a true H2O2 scavenger such as catalase can suppress the aerobic growth defects in liquid cultures (Fig. 4b) or on solid plates (Fig. 4c) of cells lacking Tpx1, overexpression of HA-OxyR cannot fully suppress those defects (Fig. 4b,c). We propose that the main difference between a H2O2 scavenger such as Tpx1 and a peroxide sensor such as OxyR lies in their reduction rates, which are much faster in the former. Finally, we measured the basal percentage of oxidation of OxyR in a Δtpx1 strain, to use it as an in vivo indicator of the intracellular steady-state levels of peroxides able to halt cell growth under aerobic conditions in cells lacking the main H2O2 scavenger, Tpx1. In this strain background, we interpret that the Trx system is fully available to recycle oxidized OxyR, since its main substrate, Tpx1, is absent. Assuming OxyR is 80% oxidized as shown in Fig. 4d at time 0, and using the correlation in Additional file 5: Figure S5, we estimated an intracellular concentration of H2O2 of 0.3 μM in basal conditions of strain Δtpx1. This level of H2O2 seems to be sufficient to slow down the growth rate, as observed in Fig. 4b, and to halt the growth of S. pombe on rich media solid plates (Fig. 4c). Once we established that Tpx1 and OxyR are present at comparable concentrations in the same cell type, S. pombe, and that both rely on the main thioredoxin, Trx1, for reduction, we analyzed the kinetics of oxidation of all the components of these two redox systems: Tpx1, Pap1, Trx1, and OxyR. We first applied an acute dose of 0.1 mM H2O2. This treatment does not affect the growth of wild-type cultures (Additional file 6: Figure S6a) but is known to activate the transcription factor Pap1 rapidly and transiently [13, 34]. As shown in Fig. 5a (left panels) and in Fig. 5b, Tpx1 and Trx1 oxidation occur almost immediately, with 50–90% oxidation only 5 s after stress imposition. Oxidation of Pap1, which is maximum at 120 s, occurs only when reduced Trx1 is exhausted . OxyR oxidation is slightly slower than Tpx1-Trx1 oxidation. Oxidation of all these factors is maintained for 10–20 min. At this non-toxic concentration of extracellular peroxides, both systems, Tpx1-Pap1 and OxyR, behave similarly, at the level of both timing and duration of the active/oxidized stage. It is important to point out that at lower concentrations of extracellular peroxides such as 20 or 50 μM extracellular H2O2, Tpx1 oxidation occurs but Pap1 remains inactive, since reduced Tpx1 and Trx1 are not fully depleted from cells (Additional file 6: Figure S6b). At these concentrations, OxyR is already oxidized (Fig. 3 and Additional file 6: Figure S6b). Thus, OxyR senses concentrations of H2O2 lower than those sensed by Pap1, even though Tpx1 senses peroxides more than an order of magnitude earlier than OxyR. Higher concentrations of H2O2, however, impinge on both types of cascades in different ways (Fig. 5a, right panel and Fig. 5c). We found that 0.5 mM extracellular peroxides exert toxic effects on fission yeast cells, reflected by the 4 h lag time on growth curves (Additional file 6: Figure S6a). Under these conditions, OxyR oxidation is even faster than before, with 100% oxidation only 5 s after stress imposition. OxyR is oxidized during the experiment, which is a reflection of the high intracellular levels of peroxides (Fig. 5c). In contrast, Tpx1, Trx1, and Pap1 undergo two waves of oxidation: (i) An initial transient oxidation lasts only 1–2 min, since after a sufficient number of cycles, Tpx1 is poisoned by these high concentrations of peroxides. Tpx1-SO2H accumulates and remains for 30–40 min (Fig. 5a, right panel and Fig. 5c; Tpx1-SO2H), probably until the levels of the Tpx1-SO2H reductase Srx1 have built up [12, 13]. (ii) Then, 40 min after stress imposition, a new wave of Tpx1-Pap1 oxidation appears, concomitant to the reduction of Tpx1-SO2H. From the time-course experiments, we can conclude that OxyR is a real sensor of H2O2, and remains oxidized until intracellular peroxide levels are below a certain threshold. The presence of reduced Trx1 cannot overcome the reaction rates of H2O2 with reduced OxyR, since with 0.5 mM peroxides, 100% of OxyR is oxidized from 2 to 40 min even though Trx1 is fully reduced. In contrast, the transcription factor Pap1 does not sense H2O2 levels. Rather, it has two requirements for a sustained oxidation: Tpx1 cycling and reduced Trx1 being exhausted. We used the experimentally determined Tpx1 oxidation ratios after applying sub-toxic and toxic doses of H2O2 (Fig. 5) to infer the temporal gradients of extracellular to intracellular peroxides using Eq. 4 (see Methods). As shown in Fig. 6, the gradients depend on the scavenging cellular capacity, and range from near 300:1 with maximum Tpx1 scavenging activity (i.e., when Tpx1 is in monomeric thiol form) to 40:1 (when Tpx1 is either fully oxidized to a disulfide or fully inactivated to the sulfinic acid form). These theoretical gradients are entirely compatible with the experimental gradients determined from OxyR oxidation previously, further validating our analysis. With the sub-toxic dose of 0.1 mM, the low gradient of 40 is temporary, with cells rapidly starting to recover the Tpx1-driven gradient of 300, while with the toxic dose of 0.5 mM the gradient collapse is much more sustained and does not recover even after 50 min. A higher extracellular concentration combined with a lower gradient is responsible for a higher intracellular concentration of H2O2 at this toxic level. Full activation of antioxidant transcription factors by moderate fluctuations of H2O2 occurs through oxidation of Cys residues, and two sensing models have been proposed. OxyR is a one-component redox cascade, and eukaryotic Prx (Tpx1)-transcription factor (Pap1) is a two-component redox relay. We have combined experimentally obtained data and applied equations to measure H2O2 gradients through biological membranes, to calculate intracellular peroxide levels involved in signaling and in toxicity, and to define the two modes of action of the two sensing modules. While OxyR is a direct H2O2 sensor, Pap1 oxidation follows two premises: (i) It is oxidized by Tpx1 only when reduced Trx1 is transiently depleted and Tpx1 is no longer acting as a peroxide scavenger. (ii) At high H2O2 doses, the Tpx1 oxidation cycle can collapse due to Tpx1.SO2H formation, Pap1 becoming insensitive to peroxides until Srx1 facilitates sulfinic acid reduction. Only OxyR and Tpx1 contain true Cys redox switches, and therefore, are able to detect mild fluctuations of peroxides. Both display fast second-order oxidation reaction rates, with that for Tpx1 being one or two orders of magnitude higher than that for OxyR. However, the Tpx1 reduction/recycling kinetics are also extremely fast, while OxyR reduction is not, at least once expressed in fission yeast. The ratio between the rate of oxidation and the rate of reduction of a thiol protein is very important in defining its response to H2O2 . In the present case, we observed that the reduction rate of Tpx1 is more than 20 times higher than OxyR reduction. As a consequence, Tpx1 can efficiently scavenge peroxides, since reduced Tpx1 is readily available after each oxidation cycle, while OxyR cannot directly act as a peroxide scavenger, even when overexpressed in fission yeast. Another consequence of the fast reduction of Tpx1 is the induction of retroactivity by the consumption of oxidized Tpx1, diverting it from Pap1 oxidation. In biological systems, retroactivity can be defined as a flow of matter between two modules in which the downstream module affects the dynamic behavior of the upstream module . In the present case, the diversion of Tpx1 oxidized moieties from Pap1 oxidation strongly impacts the response of Tpx1/Pap1 to H2O2 fluctuations. Due to the intrinsic properties of both signaling cascades, similar sub-toxic concentrations of peroxides, of the order of 100 μM extracellular H2O2, end up fully activating both transcription factors, OxyR and Pap1, even though Tpx1 senses peroxides more than 10 times faster than OxyR (Fig. 7, center panel). In fact, OxyR can be oxidized at 50 μM (Fig. 3 and Additional file 6: Figure S6b). This important observation indicates that in the two-component redox relay, a kinetic barrier exists when relaying the oxidation from the first component for the second component. This barrier can be very high if the first component is reduced very fast, and in such cases the signal is relayed only when the reducing partner of the first component is also oxidized. This Tpx1-Pap1 cellular design, in which the same protein, a Prx, shares H2O2 scavenging and signaling roles, links aerobic metabolism to the activation of antioxidant cascades, since activation occurs only once the cell’s reducing power is saturated (i.e., the reduced cofactor is exhausted and oxidized Trx1 cannot be recycled). Thus, in the Tpx1-Pap1 design, H2O2 sensing and the redox state the cell are strongly connected by the fast rate of Tpx1 reduction and thus, Tpx1-Pap1 can be defined as a bifunctional module that responds to both H2O2 fluctuations and the redox state of the cell as defined by the Trx1 oxidation state. In contrast, the relatively fast oxidation rate of OxyR combined with its slow reduction kinetics eases the sustained oxidation of the transcription factor upon mild to severe H2O2 threats, so that OxyR is maintained in the active form long enough to exert its antioxidant role as a transcription factor. We propose that OxyR is a true H2O2 sensor and redox transducer. It was proposed by Aslund and colleagues that the oxidation of OxyR in Escherichia coli is constitutive in certain strain backgrounds, even in the absence of added oxidants, since the oxidation and activity of OxyR was elevated in mutants of the Trx and Grx systems. However, we show here that the thiol switch in OxyR, Cys199, does not detect disturbances in the fission yeast Grx system. Individual trx1 or trx3 deletion only affects the speed of OxyR reduction after stress imposition, but not the basal redox state of OxyR. Thus, in the OxyR design, the response to H2O2 fluctuations is partially insulated from the redox state of the cell, reinforcing our proposal that OxyR oxidation acts as a module whose single function is to sense H2O2. Signaling upon high toxic levels of peroxides impinges very differently in both antioxidant transcription factors (Fig. 7, right panel). While OxyR stays fully oxidized for longer than after mild oxidative stress, Pap1 responds in a dual kinetic fashion upon these Tpx1-inactivating H2O2 doses. Thus, Pap1 suffers two waves of oxidation, the former being very fast (lasting only 2 min after 0.5 mM extracellular peroxides) and the second being more sustained (starting 30–40 min after stress imposition). Only this second wave lasts enough to allow oxidized/active Pap1 to engage the antioxidant gene expression program. This delayed activation of the transcription factor is caused by the temporal inactivation of Tpx1 by high doses of peroxides, which accumulates with its peroxidatic Cys in the sulfinic acid form. Reduction of Tpx1.SO2H depends on Srx1, which is overexpressed in response to the activation of a second redox pathway, governed by Sty1 and Atf1 [12, 13]. Thus, the Prx-driven activation of transcription factors by H2O2 implies than an alternative cascade controls the antioxidant adaptation to high doses of peroxides, in this case the MAP kinase Sty1 cascade. Combining our experimental data with biochemical equations, we have determined the threshold of intracellular H2O2 concentration able to halt aerobic growth: 0.3 μM. These steady-state doses, detected in liquid cultures of Δtpx1 cells, are sufficient to seriously jeopardize aerobic growth. Tpx1, with its exquisite sensitivity for its substrate, is fully responsible for decreasing those steady-state levels during aerobic metabolism, and therefore Tpx1 is essential only when cells are grown in the presence of oxygen . The main H2O2 scavenger upon toxic doses of extracellular peroxides is catalase, since Tpx1 is over-oxidized at its peroxidatic Cys to SO2H (Fig. 7, right panel). However, at intermediate, sub-toxic doses of peroxides, those fully activating the Pap1 cascade, both catalase and Tpx1 contribute to H2O2 scavenging, since disulfide accumulation in Tpx1 can temporarily block its peroxidase capacity (Fig. 7, center panel). In fact, we detect Tpx1.SO2H formation after mild 100 μM H2O2 stress in Δctt1 cells (Additional file 6: Figure S6c), what suggests that intracellular levels of peroxides are higher than in a wild-type background. Applying mathematical equations to the experimental data on OxyR oxidation and on extracellular H2O2 consumption rates, we have also determined that the gradient through S. pombe membranes is around 40:1, but that intracellular H2O2 scavenging activities can enhance the gradient up to 300:1. Using Tpx1 oxidation on different concentrations of applied peroxides (Fig. 5), we calculated the transient extracellular-to-intracellular gradients, which vary largely depending on the applied H2O2 levels and on the corresponding cellular scavenging activities. Interestingly, the calculated gradients closely follow the oxidation profile of OxyR, further strengthening the H2O2 sensor role of this thiol protein. In conclusion, our study compared the two main models of H2O2 sensing and transduction. While OxyR is a real on/off-switch transcription factor and triggers an antioxidant response for as long as peroxides are over a threshold, the Tpx1-Pap1 relay system constitutes a sophisticated sensing module. Tpx1 operates during aerobic metabolism as a H2O2 scavenger, and only when the cellular recycling power is exhausted, is Pap1 activated. Higher, toxic doses of peroxides poison the two-component system and therefore, an alternative signal transduction cascade, such the Sty1-Atf1 pathway, is required. Here we report on the characterization of two well-established sensor modules of H2O2, OxyR and Tpx1-Pap1. Applying mathematical equations to the experimental kinetic data, we have defined that (i) 0.3 μM intracellular H2O2 is a toxic threshold capable of halting cell growth; (ii) the gradient of extracellular to intracellular peroxides through fission yeast membranes is around 40:1, but that intracellular H2O2 scavenging activities can enhance this gradient up to 300:1; and (iii) while Tpx1 is in essence a H2O2 scavenger due to fast oxidation and reduction kinetics, OxyR is a true H2O2 sensor but not a scavenger, since it cannot be reduced as fast as it is oxidized. Cells were grown in rich medium (YE) or minimal medium (MM) at 30 °C as described previously . The origins and genotypes of strains used in this study are outlined in Additional file 7: Table S1. Most of them were constructed by standard genetic methods. Plasmid p490', containing the HA-oxyR gene under the control of the constitutive sty1 promoter, was linearized and integrated by homologous recombination at the leu1–32 locus of different strain backgrounds. Some strains were obtained by crossing. To overexpress catalase, we cloned the ctt1 gene into pREP.42×  to yield plasmid p418.42×. The nmt promoter from plasmid p418.42× was replaced with a constitutive sty1 promoter from plasmid p386' , to yield the episomal plasmid p464. To quantify HA-OxyR in fission yeast relative to another HA-containing protein for which we have a polyclonal antibody, we used episomal plasmid p123.41×, expressing HA-Tpx1 under the control of the nmt41 promoter . Modified trichloroacetic acid (TCA) extracts were prepared by blocking thiols with 4-acetamido-4′-maleimidylstilbene-2,2′-disulfonic acid (AMS) and separated in non-reducing denaturing electrophoresis as previously described  with the following modifications. AMS is a bulky alkylating agent that alkylates cysteines in the thiol form only, which have a net molecular weight of ~0.5 kDa for each moiety of AMS incorporated. Acetone-washed TCA cell pellets corresponding to 5 ml of cultures (5 × 107 cells) were resuspended in 50 μl of 2.5 mM AMS (from a 25 mM stock) in 200 mM Tris-HCl (pH 7.5), 1 mM ethylenediaminetetraacetic acid (EDTA), and 1% sodium dodecyl sulphate (SDS). Samples were incubated for 2 h at 37 °C. Extracts were separated by non-reducing SDS-polyacrylamide gel electrophoresis (SDS-PAGE) and analyzed by Western blot. HA-OxyR, Tpx1, Tpx1.SO2H, Pap1, and Trx1 were immuno-detected with monoclonal house-made anti-HA antibodies, or with anti-Tpx1 , anti-peroxiredoxin-SO3 antibody (LabFrontier, Seoul, South Korea), anti-Pap1 , and anti-Trx1  polyclonal antibodies, respectively. Anti-Sty1 polyclonal antibody  was used as the loading control. All the Western blots and experiments described in the manuscript have been biologically replicated with almost no variation, as shown in Additional file 8: Table S7. Relative quantification of protein levels in Western blots was performed by scanning membranes with a Licor 3600 CDigit Blot Scanner (Licor Inc., USA) and using the Image Studio™ 4.0 software. Quantifications of the Western blots used to create Fig. 3, Fig. 5b, c, Fig. 6 and Tables 3 and 4 are included in Additional file 9. To calculate the intracellular concentration of HA-OxyR in fission yeast, we obtained TCA extracts of wild-type cells expressing or not HA-OxyR, and of ∆tpx1 expressing HA-Tpx1 from a plasmid. We normalized the protein extracts with commercial anti-tubulin antibodies, and we determined the relative levels of HA-Tpx1 using anti-Tpx1 antibodies. We used the same extracts to compare the expression levels of HA-OxyR using in-house anti-HA antibodies. Knowing that the intracellular concentration of Tpx1 is around 7 μM [25, 40], we determined that the intracellular concentration of the HA-OxyR monomer expressed in fission yeast is 1.6 ± 0.3 μM. To measure survival on solid plates, S. pombe strains were grown, diluted, and spotted on YE plates, which were incubated at 30 °C for 2 or 3 days. To grow cells in solid media in an anaerobic environment, we incubated the plates at 30 °C in a tightly sealed plastic bag containing a water-activated Anaerocult A sachet (Merck, Darmstadt, Germany)  or in a nitrogen-filled anaerobic chamber (Forma Anaerobic System, Thermo Electron Corp.). Yeast cells were grown in YE or MM from an initial OD600 of 0.2 or 0.5, as indicated, in 96-well plates. Cell growth was monitored using an assay based on automatic measurements of optical densities, as previously described . After the addition of the indicated concentrations of H2O2 to MM cultures of strains at an OD600 of 0.5, 1-ml aliquots were taken at different time points, and stopped by the addition of 110 μl of TCA 100%. Samples were then centrifuged to eliminate cells and 100 μl of the supernatant was used to determine the remaining H2O2 concentration. This was achieved by the addition of 27 μl of 10 mM ferrous ammonium sulfate and 13.5 μl of 2.5 M potassium thiocyanate. The red ferricthiocyanate complex, which appears because of the oxidation of Fe(II) by H2O2, was quantified by measuring the OD at 480 nm. It was compared to H2O2 standards, ranging from 10 to 100 μM H2O2. In Eq. 1, Targetrd| t refers to the fraction of the thiol protein in the reduced form observed at time t. kactivation and kswitch-off are pseudo-first-order rate constants for the oxidation and reduction of the thiol protein. kactivation can be written as [H2O2] × ktarget + H2O2 with [H2O2] being the H2O2 concentration attained in the vicinity of the thiol protein and ktarget + H2O2 being the second-order rate constant for the reaction between the thiol protein and H2O2. Finally, Targetrd|0, is the fraction of the thiol protein in the reduced form observed at time 0. kactivation and kswitch-off were estimated from non-linear fits to the experimental data. From kactivation, the intracellular H2O2 concentration attained during the experiment was calculated using the published value ktarget + H2O2 = 1.4 × 105 M− 1 s− 1 for OxyR and therefore, by inputting the known experimental extracellular H2O2 concentration, the gradient between the extracellular and the intracellular concentrations of H2O2 was estimated. Alternatively, experimental H2O2 concentration gradients were determined from the ratio between the rate of removal of intracellular H2O2 and the rate of removal of extracellular H2O2. The removal of extracellular H2O2 is obtained from the pseudo-first-order rate constant (kcons), which characterizes the kinetics of H2O2 consumption by intact cells. kcons was determined by fitting the H2O2 consumption profiles shown in Additional file 4: Figure S4 to an exponential decay (Table 1). The intracellular removal of H2O2 is estimated from the published concentrations of Tpx1 and Ctt1 and respective second-order rate constants for the reaction with H2O2 (see Table 2). Thus, these two methods are fully independent of each other, as they rely on different experimental measurements and published values. where k H2O2_OxyR is the second-order rate constant for the oxidation of OxyR by H2O2. kswitch-off lumps all activities that are able to reduce OxyR, and here, only those originating in Trx1 and Trx3 were included. k Trx1_OxyR and k Trx3_OxyR are the second-order rate constants for the reduction of oxidized OxyR by Trx1 and Trx3, respectively. where k H2O2_Tpx1 is the second-order rate constant for the oxidation of Tpx1 by H2O2, k Trx_Tpx1 is the second-order rate constant for the reduction of oxidized Tpx1 by a thioredoxin, and kswitch-off is equal to k Trx_Tpx1 × [Trx]rd. where R is the ratio between the intracellular and extracellular H2O2 concentrations. This work is supported by the Ministerio de Economía y Competitividad (Spain), PLAN E, and FEDER (BFU2015–68350-P to EH), by Fundação para a Ciência e a Tecnologia (Portugal;, project UID/MULTI/00612/2013 to FA), and by Generalitat de Catalunya (Spain; 2014-SGR-154 to EH and JA). AD is the recipient of a pre-doctoral fellowship from Generalitat de Catalunya (Spain). EH is the recipient of an ICREA Academia Award (Generalitat de Catalunya, Spain). AD performed most of the experiments. FA applied the mathematical equations to the experimental data. AD, JA, FA, and EH analyzed the data. EH and FA wrote the manuscript. All authors read and approved the final manuscript.